For other uses, see Fortunate Son (disambiguation). The song reached #14 on the United States charts on November 22, 1969, the week before Billboard changed its methodology on double-sided hits. The tracks combined to climb to #9 the next week, on the way to peaking at #3 three more weeks later, on 20 December 1969. It won the RIAA Gold Disc award in December 1970. Pitchfork Media placed it at number 17 on its list of "The 200 Greatest Songs of the 1960s". Rolling Stone placed it at #99 on its "500 Greatest Songs of All Time" list. In 2014, the song was added to the National Recording Registry by the Library of Congress for being "culturally, historically, or aesthetically significant." The thoughts behind this song - it was a lot of anger. So it was the Vietnam War going on... Now I was drafted and they're making me fight, and no one has actually defined why. So this was all boiling inside of me and I sat down on the edge of my bed and out came "It ain't me, it ain't me, I ain't no senator's son!" You know, it took about 20 minutes to write the song. According to his 2015 memoir, Fogerty was thinking about David Eisenhower, the grandson of President Dwight D. Eisenhower, who married Julie Nixon, the daughter of then-President-elect Richard Nixon in 1968, when he wrote "Fortunate Son." "Fortunate Son" wasn't really inspired by any one event. Julie Nixon was dating David Eisenhower. You'd hear about the son of this senator or that congressman who was given a deferment from the military or a choice position in the military. They seemed privileged and whether they liked it or not, these people were symbolic in the sense that they weren't being touched by what their parents were doing. They weren't being affected like the rest of us. The song has been widely used to protest military actions as well as elitism in a broader sense in Western society, particularly in the United States; as an added consequence of its popularity, it has even been used in completely unrelated situations, such as to advertise blue jeans. It attracted criticism when Bruce Springsteen, Dave Grohl, and Zac Brown performed the song together at the November 2014 Concert for Valor in Washington D.C.. Fogerty, a military veteran, defended their song choice. The song has since been recorded or performed by many artists. U2 made a cover during Zoo TV Tour era in 1992, appearing on the "Who's Gonna Ride Your Wild Horses" single and the anniversary album Achtung Baby (Deluxe Edition) of 2011. Wyclef Jean's cover of the song was played over the beginning and ending credits of The Manchurian Candidate (2004). Fogerty recorded a version of the song with Foo Fighters for his 2013 album Wrote a Song for Everyone. It was also covered by Dropkick Murphy's on the 2001 album Face to Face vs. Dropkick Murphys.. In 2008, Cat Power included a cover of the song on their Dark End of the Street album. The song is used in the introduction sequence of the game Battlefield Vietnam where it is among a list of in-game playable tracks. The song was also used during the E3 announcement trailer for Battlefield: Bad Company 2: Vietnam and is also the main menu song for the game and plays mid-game in vehicle radios. 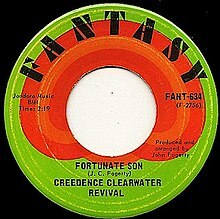 "Fortunate Son" was also included in the game Call of Duty: Black Ops at the start of the level S.O.G. Its use is an anachronism, as the level S.O.G. takes place during the Battle of Khe Sanh, a year before the song is released. In Homefront, the song is played during the chapter "Golden Gate." A cover of the song was released as DLC for Rock Band in 2007. The first appearance of the song came out before real instruments were integrated. The original version was made available to download on March 1, 2011, for use in Rock Band 3 PRO mode which takes advantage of the use of a real guitar / bass guitar, along with standard MIDI-compatible electronic drum kits in addition to vocals. The master recording by CCR was made available as well in 2010. The song is also playable on basic controllers in Guitar Hero: Warriors of Rock. The song is briefly played as both its original recording and a solo a cappella rendition, sung by Jessy Carolina, in BioShock Infinite. The song is featured in the video game Grand Theft Auto V on the in-game radio station Los Santos Rock Radio, though the song is only available for the Xbox One, PlayStation 4 and PC versions of the game. The song is featured in the 2016 video games Mafia III, where its use is an anachronism, as the game takes place a year before the song was released, as well as Watch Dogs 2. In the 1980 film Melvin and Howard the song is played after Melvin drops Howard off in Las Vegas. In the 1994 film Forrest Gump, "Fortunate Son" is featured, and is the introduction song in the scene where Forrest and Bubba are shown flying in a U.S. Army UH-1C Huey helicopter, to the combat zone in South Vietnam, c. 1966, in the Vietnam War. In the 2001 film Black Hawk Down, The song is played as part of the opening scenes. In the 2004 version of the film The Manchurian Candidate, a cover version of this song performed by Wyclef Jean is featured and is the opening track of the closing credits. In the 2007 film Live Free or Die Hard this song is featured several times. In the 2009 episode "In Country...Club" from American Dad! this song plays when Stan brings his son to a Vietnam War reenactment. The song however was not credited. In the 2010 film Little White Lies (called the French Big Chill, in part for its use of American rock classics), "Fortunate Son," performed by Creedence Clearwater Revival is featured. In the 2010 episode "Chuck Versus the Beard" from the show Chuck, this song is covered by the band Jeffster!. In the 2012 film Battleship, the original CCR version plays over the closing credits. In the 2016 film War Dogs this song is featured. In 2016, this song was included in the soundtrack album for the film Suicide Squad. In the 2017 film Logan Lucky this song is featured during a montage sequence. In the 2018 Family Guy episode "Family Guy Through the Years", the song is played when Quagmire describes his Vietnam experience, which he heard constantly due to its association with the war. Yes, the people that owned Fantasy Records also owned all my early songs, and they would do all kinds of stuff I really hated in a commercial way with my songs. ... Then one day somebody from the L.A. Times actually bothered to call me up and ask me how I felt, and I finally had a chance to talk about it. And I said I'm very much against my song being used to sell pants. ... So my position got stated very well in the newspaper, and lo and behold, Wrangler to their credit said, "Wow, even though we made our agreement with the publisher, the owner of the song, we can see now that John Fogerty really hates the idea", so they stopped doing it. ^ James E. Perone (January 1, 2001). Songs of the Vietnam Conflict. Greenwood Publishing Group. pp. 60–. ISBN 978-0-313-31528-2. ^ "Creedence Clearwater Revival". .telus.net. January 2, 1971. Retrieved June 12, 2010. ^ "Creedence Clearwater Revival". Cleveland, Ohio: Rock & Roll Hall of Fame. Retrieved July 4, 2017. ^ Whitburn, Joel (1990). The Billboard Hot 100 Charts: The Sixties (October 25, 1969 through December 27, 1969). Menomonee Falls, Wisconsin: Record Research, Inc. ISBN 0-89820-074-1. ^ Murrells, Joseph (1978). The Book of Golden Discs. London: Barrie and Jenkins Ltd. p. 257. ISBN 0-214-20512-6. ^ "Staff Lists: The 200 Greatest Songs of the 1960s". Pitchfork Media. August 18, 2006. Retrieved December 15, 2013. ^ "Fortunate Son by Creedence Clearwater Revival". Songfacts.com. Retrieved June 12, 2010. ^ The Voice (US), Season 9 Episode 7. Originally aired October 12, 2015. ^ "Is Creedence Clearwater Revival's 'Fortunate Son' About Al Gore?". Urban Legends Reference Pages. Snopes.com. Retrieved August 25, 2006. ^ Fogerty, John (2015). Fortunate Son: My Life, My Music. With Jimmy McDonough. Little, Brown. p. 190. ISBN 0316244562. ^ a b Baker, Bob (November 1, 2002). "Fogerty to Wrangler: Song in ad 'ain't me' - SFGate". Articles.sfgate.com. Retrieved March 26, 2010. ^ Lewis, Randy (November 12, 2014). "John Fogerty defends 'Fortunate Son' song choice at Concert for Valor". Los Angeles Times. Retrieved November 14, 2014. ^ Greene, Andy (June 6, 2013). "Fogerty and Friends Go Back to the Bayou". Rolling Stone (1184): 23. ^ "Fortunate Son by Dropkick Murphys on WhoSampled". WhoSampled. Retrieved March 27, 2018. ^ Gaddo, Kyle (February 25, 2011). "Eleven Legacy Rock Band Tracks Getting PRO Upgrades March 1st". DualShockers. Archived from the original on May 25, 2013. Retrieved November 9, 2012. ^ Snider, Mike (June 10, 2010). "Rock Band 3: What's New, What's Notable". USA Today. Retrieved November 8, 2012. ^ Pinchefsky, Carol. "Irrational Games Makes Serious Misstep with 'BioShock: Infinite' Soundtrack Offering". Forbes. Archived from the original on February 22, 2014. Retrieved January 16, 2014. ^ "The Manchurian Candidate (2004) - Soundtracks". IMDb. Retrieved October 8, 2014. ^ "'American Dad!' In Country... Club (TV Episode 2009) - Soundtracks". IMDb. ^ Kaufman, Gil (June 17, 2016). "'Suicide Squad' Soundtrack: Skrillex & Rick Ross, Panic! at the Disco Cover 'Bohemian Rhapsody' & More". Billboard. Retrieved June 22, 2016. ^ Baker, Bob (October 23, 2002). "Their 'Son' was Fogerty's baby; The last thing the singer wants is a Creedence corporate revival, but he doesn't own the rights, so 'Fortunate Son' now sells jeans". Pqasb.pqarchiver.com. Retrieved March 29, 2010. ^ "British single certifications – Creedence Clearwater Revival – Fortunate Son". British Phonographic Industry. Select singles in the Format field. Select Silver in the Certification field. Type Fortunate Son in the "Search BPI Awards" field and then press Enter. ^ "American single certifications – Creedence Clearwater Revival – Fortunate Son". Recording Industry Association of America. Retrieved November 30, 2018. If necessary, click Advanced, then click Format, then select Single, then click SEARCH. Library of Congress essay on the song's addition to the National Recording Registry. This page was last edited on 10 April 2019, at 19:00 (UTC).